Nearly every parent has experienced relief at dropping children off at school because it meant a few sweet hours free of conflict. There are days, sometimes weeks, when siblings seem to be engaged in a competition to find the most inane topic for argument. These are just things I remember from my childhood, I haven’t even started on the phrases my children used that caused my neck muscles to tense and my temples to throb. These selfish, sometimes ridiculous spats, are ample proof that children are sinners living in a sinful world. So what do we do about the fighting? Resist the temptation to separate the combatants. (Unless what they really need most is a nap.) Put away the electronic devices that keep each child quietly entertained. Send them outside, or to the playroom. Give them a board game, a ball, or a large cardboard box and make them play. Let them play because when they play they learn how to deal with conflict. Play offers children a unique opportunity to observe, try solutions, and learn about their feelings in a relatively safe environment. Some days when I supervised school recess, I wondered if play wasn’t just a series of small spats interspersed with an occasional good idea. I probably wasn’t too far off in my evaluation. When children play they get a chance to acknowledge (and announce) their feelings. They get to make choices and see the good and bad consequences. They get to think about alternatives and learn to make plans. They get to learn how to identify the problem, regulate emotions, and learn what they can and cannot control. Fighting at home, or on the playground, teaches them better solutions for social interaction. Play gives them practice in conflict resolution. I don’t like it when you . . .
Help them to identify feelings and possible solutions – then let them try the solutions. As you can see from this verse, even St. Paul had to deal with tattling and conflict. God will bless you and your children in play, prayer, and patience. 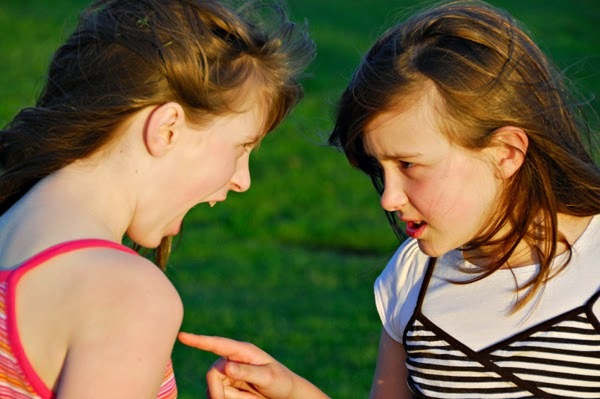 Here is a great article that talks more about the benefit of play and conflict resolution skills.